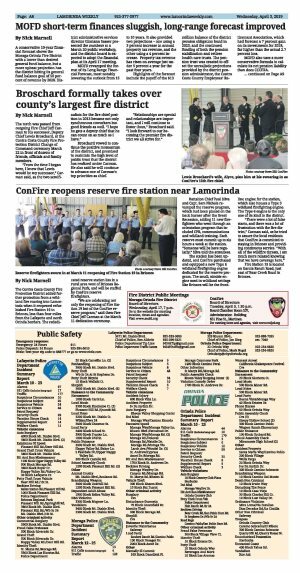 A conservative 10-year financial forecast shows the Moraga-Orinda Fire District with a lower than desired general fund balance, but a more upbeat projection has the district hitting its general fund balance goal of 50 percent of revenue by 2028. District administrative services director Gloriann Sasser presented the numbers at a March 20 public workshop, and the district board is expected to adopt the financial plan at its April 17 meeting. MOFD revamped the format of its Long Range Financial Forecast, most notably lowering the outlook from 15 to 10 years. It also provided two projections - one using a 3 percent increase in annual property tax revenue, and the other using a 4 percent increase. Property tax revenue has risen on average just under 5 percent a year for the past four years. Highlights of the forecast include the payoff of the $13 million balance of the district pension obligation bond in 2023, and the continued funding of both the pension stabilization and retiree health care trusts. The pension trust was created to offset the unrealistic projections provided by the district pension administrator, the Contra Costa County Employees' Retirement Association, which had forecast a 7 percent gain on its investments for 2018, far higher than the actual 2.7 percent loss. MOFD also uses a more conservative formula to calculate its net pension liability than does CCCERA. Rather than the 7 percent figure the pension plan administrator uses, the district assumes a 6.25 percent discount rate on future obligations and a 6.25 percent investment earnings rate, the same figure MOFD uses to calculate its retiree health care liability. Between the required annual CCCERA payments and the money the district places into its pension and retiree health care trust funds, MOFD forecasts that it will pay down nearly $35 million of its current $49 million net pension liability and $11 million of its $14.8 million retiree health care liability by 2029. Using the forecast of a 3 percent property tax revenue increase, the district projects a deficit into 2022, partly due to pension bond and trust fund payments, and its capital projects fund shows a deficit in eight of the next 10 years. Through 2029 the number of district personnel remains at 78, including 57 on-duty firefighters and three battalion chiefs. The rebuild of Fire Station 41 and the district administration building is planned for 2019. The projection for the current fiscal year, ending June 30: Total general fund revenue of $24.7 million, with expenses of $23.5 million, and a general fund balance of $6.4 million.